This exploded view illustrates the internal construction of a Tibbo Project System (TPS) assembled in the Tibbo Project Box (TPB). Specifically, this is the size 2 system (TPS2) in the size two Box (TPB2). A Tibbo Project Box comprises the bottom cover, left and right side walls, the top cover, and the LED light guide. Unless this is the TB2L system with LCD and keys, the top cover has two recesses for paper inserts and protective cover overlays. Paper inserts are for marking wires and connectors in the same way you mark direct dial buttons on your office phone. The Box assembly is extremely easy and fast. Snap the LED light guide into the top cover, then attach the left and right walls onto the top cover as well. All three parts snap into place with a "click". To avoid confusion, the inner surface of the bottom cover has arrows indicating left, right, top, and bottom. The left wall has the "L" mark on it, while the right wall is marked "R". Notice that the left wall has a cutout for the terminal blocks and the RJ45 jack of the Tibbo Project PCB (TPP). There are 2 sets of screws supplied with each Box. Smaller screws secure the TPP, large screws are for the Box itself. Pay attention to the TPP placement. In the normal bottom cover orientation (judging by arrows printed on the inner surface of the cover), the RJ45 jack should face away from you. You will notice that the bottom cover has a small protrusion on which the RJ45 rests if the TPP is correctly installed. 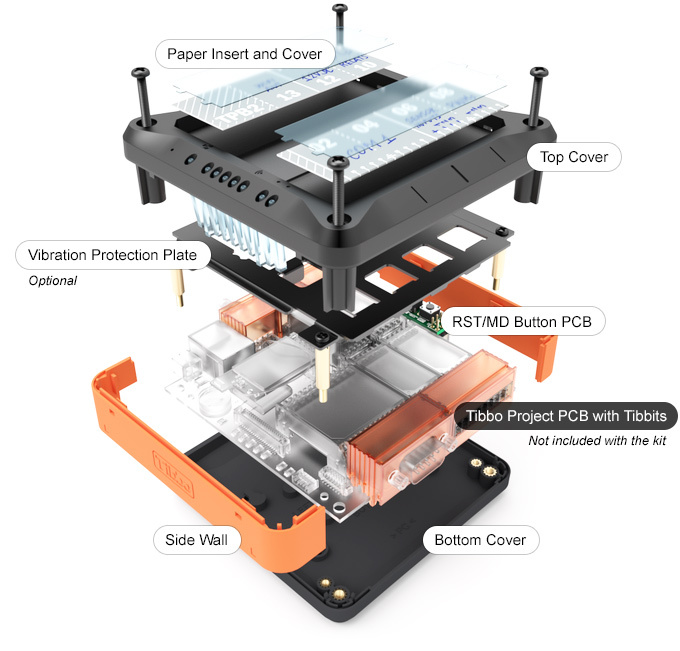 Each Tibbo Project Box kit additionally includes the MD/RST button PCB. This PCB plugs into the TPP. The PCB is necessary if the TPP is to be assembled into the Tibbo Project Box. The vibration protection plate shown above is optional and must be purchased (specified) separately as a part of the vibration protection kit (VPK).